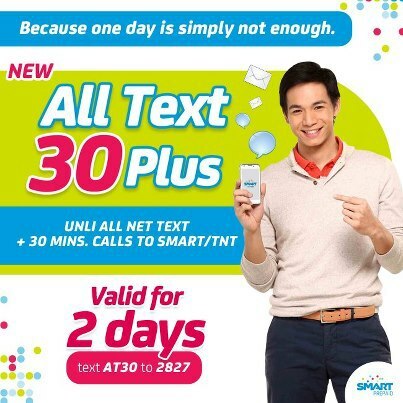 Check out the Smart Prepaid new All Text 30 Plus, where you can enjoy unlimited all network texts plus 30 minutes of voice call to Smart & Talk ‘n Text for two days! Text AT30 to 2827 to register. You can also enjoy unlimited texting to all networks for as low as P10 with other SMART All Text Promo. You can visit Smart Prepaid Facebook Page and website at www1.smart.com.ph for details and latest updates. how to load unlisurf50 direct to the customer it is not in the menu of smartload wallet.